I've been running and testing my app in the iOS Simulator using a 4-inch device. If I run using a 3.5-inch device the label doesn't jump. In my .xib, under Simulated Metrics, I have it set as Retina 4-inch Full Screen. Any idea why I'm only seeing this problem on a 4-inch device? In IB, if I choose "Navigation Bar" in Simulated Metrics, my label still jumps. The only way I can get my label to render correctly on the first screen is to not set a navigation controller as my window's root view controller. My window's rootViewController is being set to a UINavigationController whose rootViewController has a UIPageViewController embedded. When my app loads, the initial view is presented with it's content pushed down a bit, roughly the same size as a navigation bar. When I scroll the pageViewController, the content jumps up to where it was placed in the nib, and all other viewControllers loaded by the pageViewController are fine. No need to put anything in viewWillLayoutSubviews (as one of my previous answers suggested). These two caveats should explain the intermittent problems experienced by others in the thread. Better would be to set the contentInset on the scroll view yourself, but unfortunately the UIPageViewController doesn't expose the scroll view. My original answer solved the problem for the time being, but after a while the same problem came back to bite me. // have gotten it's bearings and everything is laid out just fine. I have the same problem. I solve it by putting setViewControllers for the first page in UIPageViewController's viewDidLoad instead of setting it when I make a instance of UIPageViewController. Also, I need to set automaticallyAdjustsScrollViewInsets to NO. I had a similar problem but none of the solutions here worked. My problem was that whenever I would scroll to the next page, the content would jump down, ending in the correct position, but starting 20 pixels too high (clearly something to do with the status bar). My container VC was not a nav VC. After pulling my hair out for a while, the solution that ended up working for me was just to make sure that none of the constraints in my content VC were connected to the top layout guide. This may or may not be feasible in your case, but in mine it was, and it was the only thing that solved the content jump. Also very curiously, this problem only manifested when the transition style was set to scroll. Just changing it to page curl made the issue disappear. But I needed scroll. Hope this helps someone else. 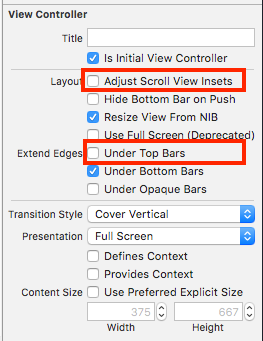 Try to select PageViewController in storyboard and uncheck "Under Bottom Bars" and "Under Opaque Bars" in Attributes Inspector. MyPageViewController manages it's toolbar, and everything works as expected, both on a 4-inch and 3.5-inch device. this is my first time posting on stack overflow, but I have searching for a solution to this problem for over a week now. Here is a solution I came up with, I hope this works for anyone else with the same issue. For each content page to be displayed in the UIPageViewController, find the top-most constraint, the one between the Top of a view and the bottom of the top layout guide, and add an outlet for it to the view controller. @IBOutlet weak var topGuideConstraint: NSLayoutConstraint! Repeat for every content view controller displayed in the UIPageViewController. 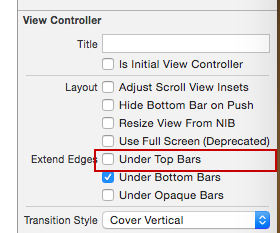 Adjust the offset as appropriate if you're also displaying a UINavigation bar. This is an unfortunate hack, and I hate having to do it, but after many hours trying different things, I'm at least happy to have something that works so I can move on. By waiting for layoutSubViews to load before setting any viewControllers to the UIPageViewController was the only thing that worked for me. Not the answer you're looking for? Browse other questions tagged ios objective-c xcode uinavigationcontroller uipageviewcontroller or ask your own question.